The Voice Assistant and Voice Interface market for the past few years has experienced an increase in demand for high quality voice apps. Although the market as a whole is in the growth stage, the need for well designed voice apps has arrived. Smart speakers, and devices with voice assistants such as Amazon’s Alexa or Google Assistant has boomed in the past year. 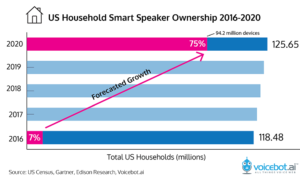 If you look farther down the line, analysts predict that by 2020, up to 75% of all US households will have some sort of smart speaker in the home. There is no doubt that this market, just like the mobile phone market of the late 2000s, will see a massive influx of voice apps to support that consumer demand. The Alexa App Store is glutted with daily briefings and trivia apps. But analyzing the usage of most apps you see that many people will use a skill once and never “touch” it again. The market is longing for valuable voice interactions that give users cause to interact with them on a regular basis. Companies have seen three main benefits from implementing voice interactions into their apps. 1) By receiving exactly what consumers are asking, businesses are able to tailor content on other platforms to best fit the information customers are looking for. 2) Some companies have found that voice interfaces can fill needs otherwise unreached by standard interface structures and 3) they have also seen that consumers feel that voice can be much more convenient and immediate than their traditional content acquisition solutions. For more information on getting a voice app developed and launched along with a full report on the voice assisted market, get in contact with us here. Is Voice The New Touch? Gone are the days when your home’s IoT devices are controlled through your smartphone or web browser. With smart speakers entering more and more consumer residences, smart home product interactions have shifted to include non-tactile interfaces which foster unique experiences. Consumers have shown that they are behind the shift, as the number one selling product during Amazon’s Prime Day on July 12 was their Echo Dot. The ability to execute commands and receive information passively without directly changing your task at hand seems to be highly valued by users. Another important feature about these products is that they can be easily integrated to work with other devices as control hubs. With the release of Google Home last November, and the arrival of a second giant to the playing field, the smart speaker/virtual assistant market entered the growth stage of its product life cycle. Prior to this, Amazon’s Echo series had controlled the market with other products launching, but either not creating traction, or having a large enough ecosystem to give them a retainable foothold. While both the Echo and the Google Home have similar functionality, the way in which they interact with other products along with the ecosystem architecture lends for different experiences depending on what product you use. Both products allow users to integrate other devices and services into their voice controlled environments, but use different methods to achieve the same purpose. Being the first major smart speaker in the market, the Amazon Echo has had a massive lead over Google Home. This is represented in the number of Echo Skills, what amazon calls its voice apps, that have been developed since they released their device. A staggering 15,000 skills have been developed as of June 2017, but it is important to note that a large number of these have only been installed under 100 times. Skills are either integrations or dedicated apps for the device. Skills have been available for the Echo since launch with developer support from the beginning. Skills are handled through an app store experience where you to install individual skills onto the Echo based on users interests. Google takes a different approach with their Google Actions, their version of the same kind of app. Actions are not separate apps that need to be installed on the Google Home, rather Actions get directly integrated into the Google Assistant and can be used immediately by users. Users can still browse available Actions through a directory. This has the benefit of not requiring users to choose apps they need ahead of time. Conversely with Actions, users may find that there are more features than they actually use build into the system. Neither Amazon or Google’s ecosystem is very challenging to integrate into current systems with straightforward processes for implementation. Both platforms have similar introductory courses on building a simple fact based app for either Alexa or Google Home. Both programs have incentives for developers to build on their platform. Google is currently trying to increase their total number of Actions through cash prizes, while Amazon has a longstanding rewards programs including Echo dot and other perks. Need assistance building your first Alexa skill? Click through to let Bluefin help you!